Since 1968, New Zealand Steel's fully integrated steel mill has produced flat steel products for both the domestic New Zealand and export markets in the Pacific region. The steel mill employs 1200 people to produce over 600,000 tonnes of steel slabs a year. New Zealand Steel's operations emit some 1.7 million tonnes of CO2e per annum (excluding any credits from co-generation). The New Zealand Government has ratified the Kyoto Protocol and will implement an emissions charge from 2007 to meet its Kyoto obligations. Pragmatically, the New Zealand Government has recognised that the international competitiveness of some New Zealand firms or industry groupings could be at risk because of the emissions charge. For firms prepared to undertake to meet world's best practice targets in the management of their greenhouse gas emissions, the Government is prepared to negotiate a full or partial exemption from the emissions charge. This mechanism is called a Negotiated Greenhouse Agreement. There is general recognition of the negative impact of any additional cost, such as an emissions charge, on the future of steelmaking in New Zealand. The Government understands that as a direct consequence, steel imports to New Zealand would increase, most probably from countries with lower environmental standards, including an absence of regulation of greenhouse gas emissions. We are now engaged in developing a Negotiated Greenhouse Agreement with the New Zealand Government and are confident that an agreement acceptable to all parties can be achieved. A new Co-Generation Plant at the Port Kembla Steelworks could potentially offset emissions elsewhere by between 600,000 and 800,000 tonnes of CO2e per annum. Re-using process gases for co-generation could generate around 170 MW of electricity, peaking at 220 MW (dependent upon the final design) which would be sold back into the grid. At present we recycle a significant amount of energy created at the Port Kembla Steelworks to generate electricity and to fuel the plant, including for example re-heat furnaces at the Hot Strip Mill, but a considerable amount is flared to the atmosphere. A new Co-Generation Plant could result in significant volumes of process gases no longer being flared to the atmosphere. BlueScope Steel is working with several different companies to study the feasibility of building a new Co-Generation Plant, which would replace the existing Co-Generation Plant and use by-product gases which are currently flared. 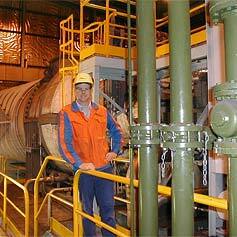 BlueScope Steel's Western Port Plant in Victoria launched two energy efficiency feasibility projects in June 2004. The projects, which have been allocated A$200,000 of government funding through the Sustainable Energy Authority's Business Energy Efficiency Initiative, were officially launched by Victorian Environment Minister. The two feasibility projects will help establish new technologies for reducing energy use in waste water treatment and develop onsite power generation capability. These initiatives will help Western Port make cost savings, operate more efficiently and contribute to a cleaner environment by significantly reducing the amount of electricity and gas used at the plant. They will also increase the amount of fresh water recycled by up to 80 per cent, and reduce licensed discharge of treated water into Western Port Bay. The two projects could significantly cut greenhouse emissions at the Hastings plant by some 192,000 tonnes of CO2e - the equivalent of taking 40,000 cars off the road. Maximise recycling and reuse of waste water by halving annual waste water discharge. A new 'closed loop' water treatment process would recycle 300 megalitres of treated water for re-use in the steelworks - enough water to fill 7,500 backyard swimming pools. These initiatives at Western Port are just some of the programs underway that are leading the Company towards a more sustainable future. The projects will result in cost savings in running the plant and show other manufacturers how much can be achieved by being smarter with energy-saving technology. The projects will bring business benefits to BlueScope Steel, significant energy savings, demonstrate a commitment to the community in which we operate, and help make sure Western Port has a sustainable long-term future. The partial redesign of Western Port's Continuous Paint Line No.2 (CPL2) has resulted in a reduction of both natural gas consumption and greenhouse gas emissions. The CPL2 has traditionally been a large user of energy, producing 30,000 tonnes of CO2 emissions each year. A team of engineers at Western Port undertook a project to reduce gas usage and ultimately gas emissions. The paint line was modified in three main areas, including a redesign of the coater room, alteration to the oven design - including reduction in the size of incinerator burners and oven volume, and improvement in oven exhaust flow. The most significant environmental improvements have been brought about by increasing exhaust velocity and improving exhaust flow temperature, as well as other oven modifications that have reduced oven exhaust flow from 40,000m3/hr to 35,000m3/hr.This represents close to a 40 per cent reduction (6.3GJ/tonne to 3.8 GJ/tonne) in natural gas consumption and equates to a greenhouse gas (CO2) reduction of approximately 14,000 tonnes per year. The project was entered in the 2003 Premier's Business Sustainability Awards in Victoria, Australia and in February 2004 the Environment Protection Authority recognised Western Port for its 32 - 67 per cent reduction in a range of airborne emissions, despite an increase in production. The Western Port team is not resting on its success and intends to explore further opportunities to reduce natural gas consumption and greenhouse gas emissions. New Zealand Steel on the edge of Manukau Harbour. 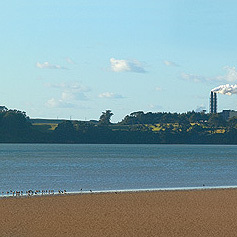 The Co-Generation Plant at New Zealand Steel.